Wild strawberries look like diminutive cultivated strawberries. If you know one, you should be able to recognize the other. Photo by Gregg Davis. I bolted upright in bed at 2 a.m., awakened by loud, forceful hail pouring down on the roof. It was June 28, just a week into summer. I got up and walked across the dark living room to peek out the sliding glass doors and watch it come down in the pitch black night. Despite the cold, hard nature of those icy pellets, the hail meant a welcome respite from a recent dry spell that had the flowers drooping in the fields and forests, starved for something to drink. The next day dawned with a thin coat of white on the mountaintops. A patch of calypso orchids bloomed in my friend’s yard. And I found my first wild strawberries of the season. Last year, the wild strawberries surprised me. I had become accustomed to them fruiting in the beginning of August at 11,000 feet where I previously lived in the dry hills of Fairplay, Colorado. Now we live lower at 10,000 feet in Breckenridge, where the breathing’s free and easy and the strawberries ripen sooner, compared to our old mountainside. It was early July and I had been circling our Peak 8 neighborhood on foot when I nearly tripped over a plentiful fruiting in the road bed atop a ditch near my apartment. Climbing down into the ditch yielded a good perspective up its steep side, and a hidden world of bright red gems hiding under the low foliage. Forget all those hours spent seeking small glimpses of red at our old place. These were the real deal, many tiny handfuls as reward for climbing down into the ditch to get at them. “It looks like a litter of puppies,” my friend Butter said. Photo by Gregg Davis. Of course, that’s keeping in mind that the ditch is not the best place for wild-food foraging. Though it’s not Interstate 70, where the plants on the right-of-way are probably covered in high concentrations of arsenic and other car-spewed chemicals, vehicles still do pass by fairly regularly. On top of that, they use magnesium chloride on the roads in winter, and who knows how that impacts the plants? And it appears, too, that dandelions on Breckenridge’s public roadsides merit a good toxic dousing, despite the fact that they are not on the noxious weed list. So there’s always the possibility of drift from that as well. (Forager looks skyward and shakes fists in despair). Obviously, better places to gather wild strawberries are those that are less trafficked. They really do like a diverse range of habitats—from dry, open hillsides to forested spots with dappled light—the latter being likely to fruit later. Keep in mind that if you collect from sandy spots, you run the risk of getting sand in your berries. In such cases, I simmer my slightly sandy strawberries and strain the sweet juice through a coffee filter, discarding the pulp. But to find them in a good forest is a special treat, because the fruit of the berries is lovely too, worth that hour spent prone on hands and knees gathering them. No strawberries here. But wait, look again! Wild strawberries are found throughout the United States, pretty much everywhere except Nevada and the Deep South. In the Midwest (at 45 degrees N latitude and 1,000 feet in elevation), they generally ripen in June and last through the start of July, according to Sam Thayer’s harvest calendar in Nature’s Garden (2010), which includes useful estimates for calendar adjustments based on elevation changes and distances from the reference point. If you live above 9,000 feet in the Rocky Mountains, on the other hand, the season is just beginning. I have found fruiting wild strawberries well into fall here in the high country, so if you don’t find them tomorrow, it doesn’t mean you’re not going to find them. The best thing to do is to learn the leaves, spot them in a variety of habitats, and keep an eye out. Perhaps it is imprudent to borrow from that age-old warning, “Leaves of three, let it be” (which reminds us that plants bearing sets of three leaflets, like poison ivy and poison oak, can cause a nasty skin rash if you touch them) for a discussion of strawberries. But strawberries, too, bear their leaflets in sets of three. They are serrated and somewhat oval-shaped, attaching together at a single point. Wild strawberry flowers have 5 white petals and yellow centers. Most common where I live is Fragaria virginiana, whose leaflets are almost blue-green in color and do not have prominent veins. There is also Fragaria vesca, which shares a similar geographical range. This strawberry’s leaves are more of a green-green and the veins are more pronounced. Both are edible-berry-bearing strawberry plants. If you learn the leaves and pick out the plants in advance, you can watch them grow over the course of a season while you hike or walk the dog. Watch for them to bloom into pretty, white, 5-petaled flowers with yellow centers. See if they have shiny red runners protruding from their bases, crawling across the ground to establish new colonies. Then as the season progresses, squint sideways at the strawberry plants as you scale a dry hill, or peek underneath those that carpet a shady forest floor. One of these days you just might glimpse red, and upon closer inspection, discover one of nature’s tiny treasures. There is also a “false strawberry” (Potentilla indica syn. Duchesnea indica) occurring in the eastern half of the U.S. and down the West Coast (USDA). It looks like a strawberry in several regards—the leaves occur as sets of three serrated leaflets (though to my eye their lobes appear rounder) and the flowers are 5-petaled (though their petals are yellow instead of white). But when you come across false strawberries in full fruit, as I have in Philadelphia lawns, they look like fat, red strawberries. The false strawberry, also edible, looks like a real strawberry but tastes like nothing. These grow on the east and west coasts of the U.S. If you find the imposter, you might be fooled. But it appears to be edible, Thayer writes (2010), and I have experienced no ill effects (aside from a complete lack of flavor) after popping one into my mouth. They’re probably not the best choice for pies or ice cream sauce, but they probably won’t hurt you either. With the exception of those who have already experienced the magic of a real wild strawberry, most people to whom I teach this plant in spring refuse to believe that delicious strawberries will form later. They are amazed by how densely the strawberry plants cover our forest floors up here, and still do not believe that all those plants might one day fruit luscious red gems, hidden beneath the forest understory. But they do. Our local wild strawberry (F. virginiana), bred with another wild strawberry that grows along the West Coast of the U.S. and down into Chile (F. chiloensis), is responsible for today’s cultivated strawberry. Just as human parents and grandparents seem always so small compared to their offspring, our juicy modern strawberries have tiny parents too. And boy, are those parents tasty! When I am a lazy enough forager that I only come home with a handful—which happens fairly often—I like to simmer them down with sugar to make ice cream sauce for two. They may be small, but they pack such a sweet strawberry punch that a little goes a long way. Macerated wild strawberries top molasses-kissed wheat pancakes. In culinary speak this is called maceration, a means for drawing the juices from fruit with sugar or alcohol. In the past it was a method of preserving fruit. It is also often a step in the making of a shrub, an old-timey, tart-sweet beverage made with macerated fruit, the syrup it produces, vinegar or alcohol, and water. The other day, in the wee morning hours when I like to write, I decided I wanted to give Grandpa Euell’s sugared berries a try. I watched the clock eagerly, waiting for the hour to strike 7 a.m. so I could wake my better half. I made it to 6:53 a.m.
“Why are you waking me up?” he asked groggily, cracking open an eye to squint bemusedly at my antics. “Because I want you to go for a walk with me to get wild strawberries,” I said. The sun was newly risen, the shadows long, and the neighborhood still relatively quiet when we snuck out of the house. We don’t get out so early very often. The light was friendly, soft and streaked upon the dewy grass as we snaked through yards and across the road to my early season strawberry spot, where we dipped deep into the ditch to look for red fruit. Gregg was excited to see the early fruiting, especially when he found the biggest two strawberries in the bunch. Our high country strawberries really “put out” under the right conditions. He helped me gather a small handful, and I tucked them away in a tiny plastic container to protect them, as they are delicate and can turn to mush easily. We got 25 total, so few as to fit easily into my palm. Before returning home, we visited the stream by the big, old spruce and tickled the twisted stalk plants, looking underneath for happy, star-shaped flowers hanging from the kinked stemlets at the leaf axils. The dark streamside was lush and green with the emerald, jointed stems of ancient horsetail bottlebrushes, alongside white-flowered heart-leaved bittercress (Cardamine cordifolia), a native mustard whose 4-petaled flowers are among the larger ones in the mustard family. In sun-kissed spots under nearby lodgepoles ran a thick and perky carpet of lupine in many shades of dark and light purples, with showy, light-pink wild rose blossoms dotted throughout. On our way back we saw bright yellow potentilla flowers on a big bush where the path wends its way through the lawns of second-homeowner condos. These are 5-petaled like the strawberry flowers, to which they are related. At home I carefully picked off the green bits and rinsed the small strawberries in a strainer, then transferred them to a small bowl and sprinkled sugar overtop. I crushed them a little, too, to speed the maceration progress, so I could use the syrup on pancakes made from the last of our pancake mix and added ingredients. A sweet, pink juice formed fast, the sugared essence of wild strawberries. Breakfast turned out to be small but delightful—one big pancake and two small ones for each of us, with a pat of butter and just enough strawberry syrup. I was thankful for that tiny gift from the universe on a cool summer morning. Fortunately, there will be plenty more opportunities to celebrate wild strawberries this summer. READ MORE: This blog post is excerpted from a longer, photo-filled piece on wild strawberries that came out in the July 2014 edition of the Wild Edible Notebook. The Notebook is a monthly magazine, available in the Apple Newsstand for iPad and iPhone (the app is free and there are a couple of free issues, then it’s $1.99/month for the rest of them), or in various PDF formats including an 8.5″ x 14″ print-and-fold booklet, a screen-reader, and a tall, skinny one designed for Android readers. The $1.99/month subscription supports the ongoing development of the publication and its many digital formats. 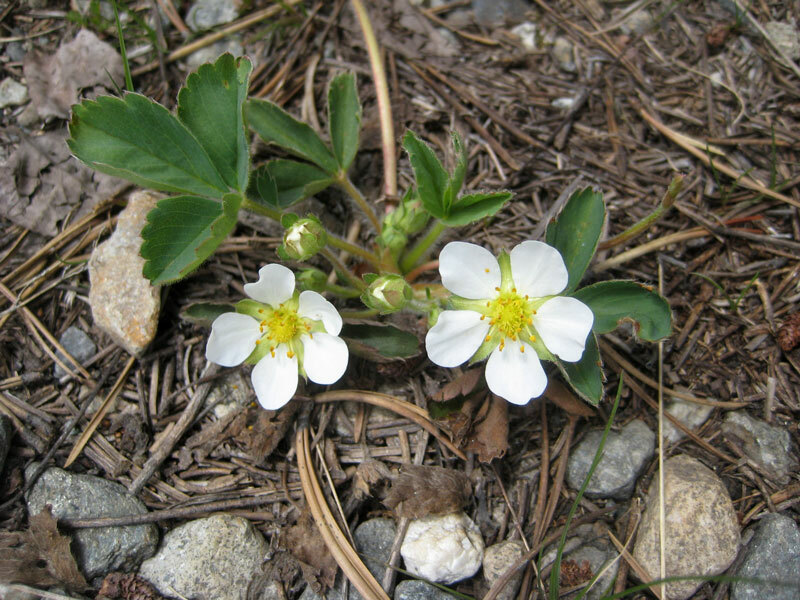 UPDATE 8.4.14: Post updated to include the newer binomial for the false strawberry, Potentilla indica syn. Duchesnea indica. I actually like false/Indian strawberries, although of course if you eat them expecting that it’s a true strawberry you will be let down. For one thing, you’ve almost certainly picked it under-ripe, and there is precisely zero flavor. Dead ripe, there is an almost evanescent taste, more of a scent than anything else, nothing at all like a regular strawberry. The green calyx will have fully pulled back long before the berry ripens, and color is no good clue either. They are ripe when the berry is swollen so much that the tiny seeds have nearly disappeared into its flesh, and not a moment before. I like them with a dollop of cream and a drop of sweet sherry. Nothing to scream about, but pleasant enough and ubiquitous here in Virginia. As a child growing up in northern B.C., Canada, wild strawberries were ubiquitous, in season of course. I remember going with the neighbor kids and having to bend over to pick off a patch so we had a spot to sit down without getting stains on our pants, and coming home to an angry mother. Then we would just sit and pick all around ourselves. Now I live in southern Manitoba, much drieer country, and though there are lots of strawberry plants in the ditches, there’s just not enough rainfall to produce that lush harvest. We take so much for granted as children.